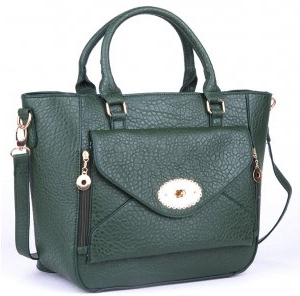 Dark Green Textured Shopper Handbag. This shopper handbag has an envelope style front pocket with pretty clasp. There is a back pocket on the outside. The top is fully zipped for extra security. It has two grab handles. The shoulder strap is detachable and adjustable. There are two internal zipped pockets and one open.